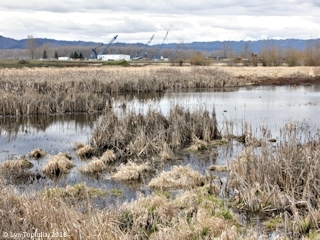 "Mathews Point and Mathews Slough, Washington"
Click image to enlarge View towards Mathews Point, Vancouver, Washington. Image taken March 4, 2018. "Mathews Point" is located at Columbia River Mile (RM) 102. Downstream is Blurock Landing and upstream is the Port of Vancouver. Mathews Point was named after John and Elizabeth Mathews who had a Donation Land Claim southwest of Shillapoo Land and Vancouver Lake. The name "Mathews Point" became official in June 1897. Other names in use had been "Mathew's Pt. ", "Matthew Point", "Matthew's Point", and "Parting Point". "Mathews Slough" was named after Samuel and Sarah Mathew who had a Donation Land Claim west of Vancouver Lake and east of Shillapoo Lake. 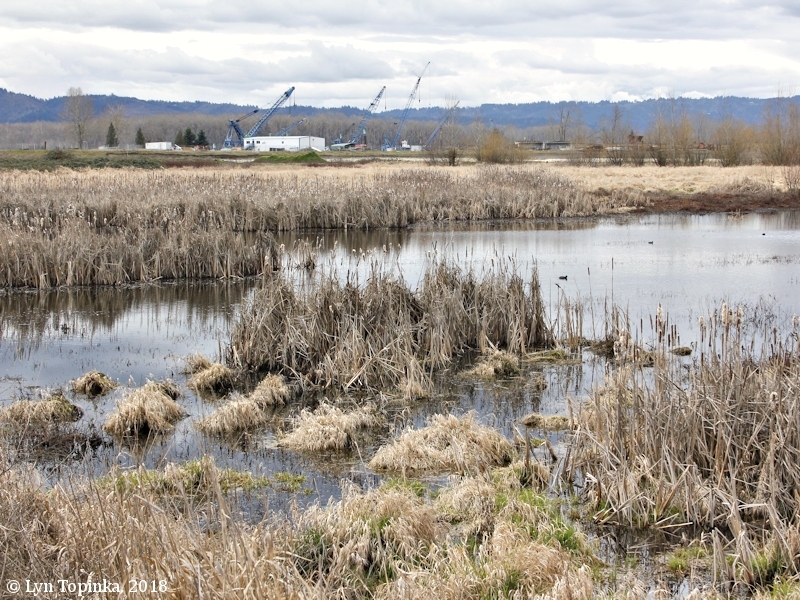 "Mathews Slough" (also seen as "Matthews Slough") is not listed in the U.S. Board of Geographic Names database (2016), however the Washington Department of Fish and Wildlife uses both "Mathew's Slough" or "Matthews Slough" in various reports. There are two "Mathew/Mathews" Donation Land Claims (DLC) in the area of Vancouver Lake. The earliest Land Claim in the area is the DLC of Samuel and Sarah Mathew and lies between Shillapoo Lake and Vancouver Lake. The U.S. Bureau of Land Management's General Land Office (GLO) Records website (2018) shows Samuel Mathew and Sarah Mathew being granted title on December 22, 1865, to 259.60 acres of T2N, R1E, Section 6, and T3N R1E Sections 30 and 31 (1850 Oregon-Donation Act). The 1860 Cadastral Survey (tax survey) map for T3N R10E shows the "Matthews" homestead near the center of Section 31. "Shillapoo Lake" is to the west and today's Buckmire Slough (depicted but not named) and Vancouver Lake are to the east. 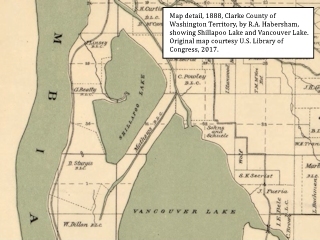 The 1863 Cadastral Survey shows the DLC of "S Mathews" between "Shillapoo Lake" and "Vancouver Lake". The 1860 Clark County U.S. Federal Census lists Samuel Mathew as being born in Virginia, a farmer, age 37, and lived in the area covered by the "Lake River Post Office". He was married to Sarah, born in Ohio, age 34, and there were two children, daughter Harriet, born in Oregon, age 4, and son Morris, age 3, born in Washington Territory. The second Land Claim is the DLC of John and Elizabeth Mathews. This DLC is the area of today's "Mathews Point". The U.S. Bureau of Land Management's General Land Office (GLO) Records website (2018) shows John H. Mathews and Elizabeth Mathews being granted title on December 3, 1877, to 215.53 acres of T2N, R1E, Sections 18 and 19 and T2N, R1W, Sections 13 and 24 (1850 Oregon-Donation Act). The 1863 Cadastral Survey (tax survey) maps for T2N R1W and T2N R1E show the DLC of "J.H. Mathews" in the lower half of Section 13. The 1883 Clark County Census lists a J.H. Mathews as being born in Missouri, age 29, and a farmer. He was married to "M.J. Mathews", age 20, born in Missouri, and there were two sons, "S.M. Mathews", age 3, and "F.M. Mathews", age 1, both born in Washington Territory. In 1792 Lieutenant Broughton, of the Captain George Vancouver Expedition, called this point "Parting Point". In 1841, Charles Wilkes of the U.S. Exploring Expedition posted "Casenoves Pt." on Map Sheet #5, and "Cazenove Point" in the "Hydrography" text. "... It is better to keep a mid-channel course, avoiding the shoal which makes off from the Deer Island side. 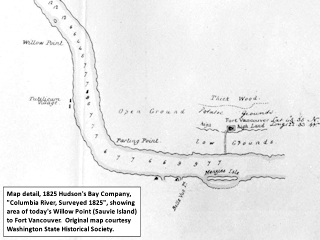 The course of the Columbia here varies to nearly south, and continues to Cazenove Point, 4 miles below Fort Vancouver." In 1897 the U.S. Board of Geographic Names made "Mathews Point" official. This point was also known as "Mathew's Point", "Matthew's Point", "Matthew Point", and "Parting Point". 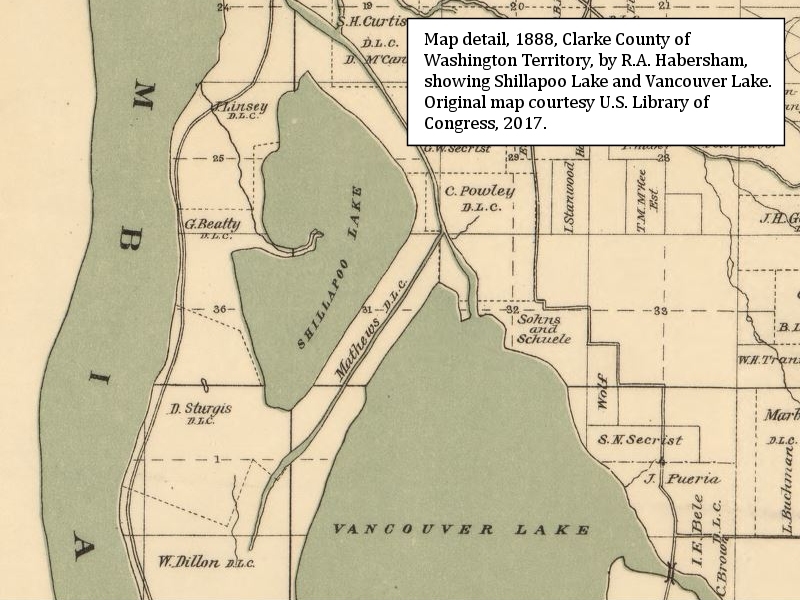 The 1913 Washington Geological Survey's "Bulletin No.17, A Geographic Dictionary of Washington" lists two different spellings of Mathews Point. The first listing is "Mathewes Point. A point on the north bank of Columbia River, about 3 miles below Vancouver, in southwestern Clarke County." The second listing is "Matthews Point. A low point on the north bank of Columbia River, about 4 miles below Vancouver, in Clarke County." Click image to enlarge Map detail, 1825, Hudson's Bay Company map "Columbia River, Surveyed 1825", showing "Parting Point". 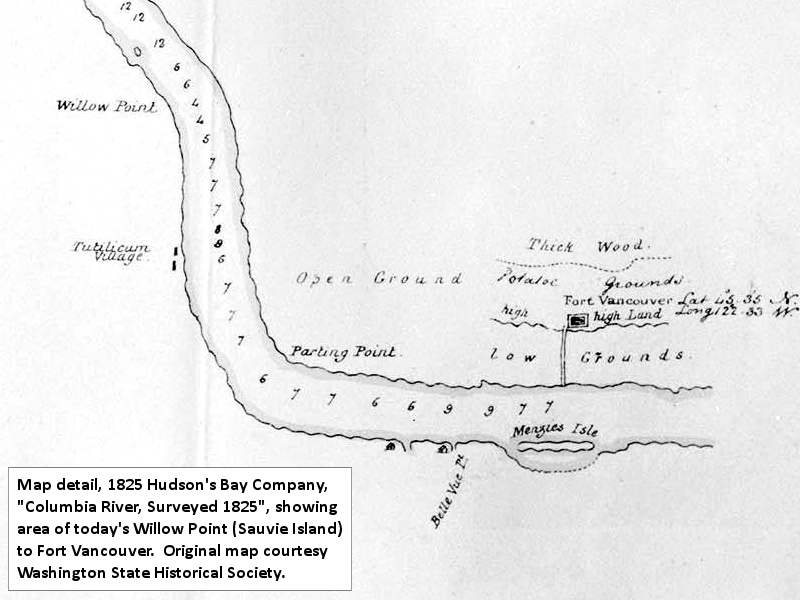 Map detail shows the area from Willow Point, Sauvie Island, Oregon, to Fort Vancouver, Vancouver, Washington. Original topographic map courtesy Washington State Historical Society, 2013. Click image to enlarge Map detail, 1888, showing the Donation Land Claim of Samuel Mathew (spelled "Mathews" on map). 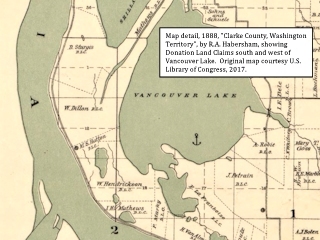 "Clarke County of Washington Territory" showing Shillapoo Lake, Vancouver Lake, and surrounding Donation Land Claims. Map by R.A. Habersham. Original map courtesy U.S. Library of Congress, 2017. Click image to enlarge Map detail, 1888, showing the Donation Land Claim of J.H. 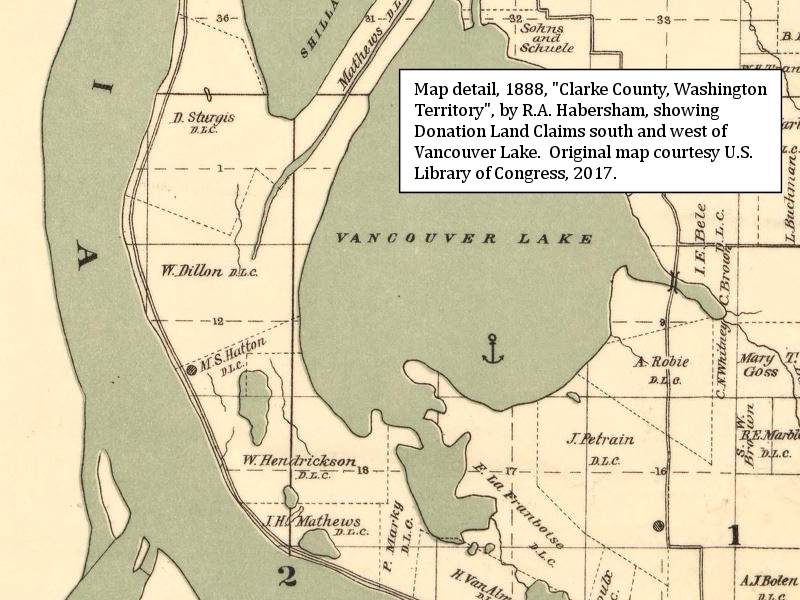 Mathews.. "Clarke County of Washington Territory" showing the Donation Land Claims south and west of Vancouver Lake. Map by R.A. Habersham. Original map courtesy U.S. Library of Congress, 2017. 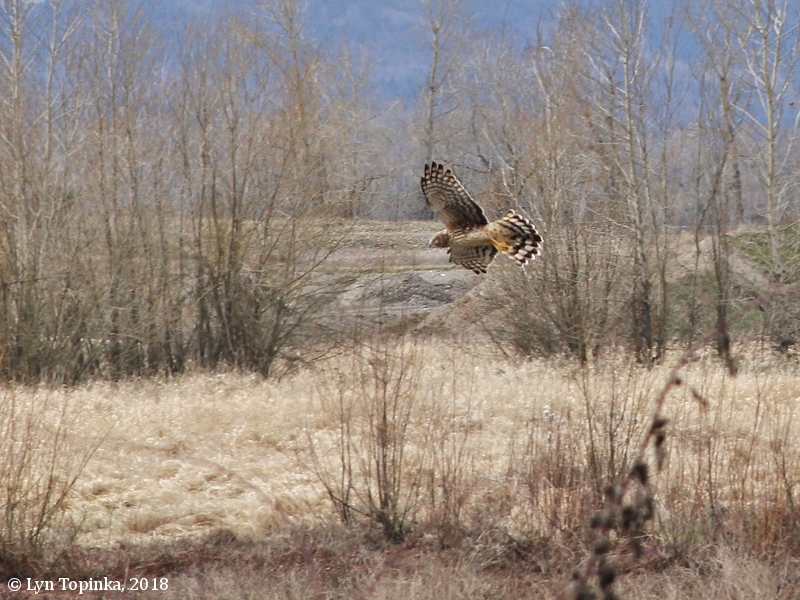 Click image to enlarge Northern Harrier, Mathews Point, Vancouver, Washington. Image taken March 4, 2018.